New York, appointed James R.
Shinners as director of marine operations-Atlantic division. The announcement was made recently by Donald G. Aldridge, senior vice president. Inc. for a four-year period, in op- erations management positions. Captain Shinners has sailed as master on various types of ves- sels. Norshipco, Norfolk, Va., has demonstrated that a 35-year-old cargo vessel, out of service for more than a decade, can be taken from mothballs and reactivated in less than six days. River, Va., reserve fleet, unseal, it, light off the boilers, and put to sea. A time limit of 10 days had been set, with the U.S. Depart- ment of Defense making clear that six days was a more de- sirable target. Norshipco accom- plished the reactivation in five days and 14 hours of a ship that had been in mothballs for 11 years. Apex Marine Corp., New York- based general agent for the ship, estimated that the reactivation cost $1.3 million, including sup- plies and hiring of temporary crew. The exercise began with a call from the Defense Department to the Maritime Administration which notified agents for the three vessels being reactivated. Angeles airport about to board a plane for New York. He changed planes and went to Norfolk. Apex Marine notified Norshipco that it had been selected for the exercise. The shipyard dispatched an eight-man crew to the Ca- tawba Victory to prepare it for towing back to the yard. Bureau of Shipping, and the Mil- itary Sealift Command. "This was the way it would be in real life," said A1 Crain, Nor- shipco's assistant plant superin- tendent, noting that such speedy ship reactivations might be nec- essary in case of war. Then divers removed plugs from sea openings in the hull and cleaned the hull and propeller. A thorough inspection of all ma- chinery came next. The boilers were put into working order. Problems with the boiler safety valves caused a loss of 20 hours. Norfolk and from as far away as Texas and Mississippi. After the electronic systems and radar were tested, there was a dockside trial for four hours, followed by a successful 24-hour sea trial. The Military Sealift Command was then notified that the Ca- tawba Victory was ready to ac- cept cargo and sail. Norshipco officials said the time to com- plete the reactivation broke all previous records for work on similar vessels. Crude Oil Washing problems come in many shapes and sizes. So do BUTTERWORTH tank cleaning machines. Because tank washing problems can be simple or complex there is no one machine that is right for every tank or task. Butterworth Systems can help you select precisely the right machine or combinations of machines for your vessel, so you get the optimum cleaning system at minimum cost. 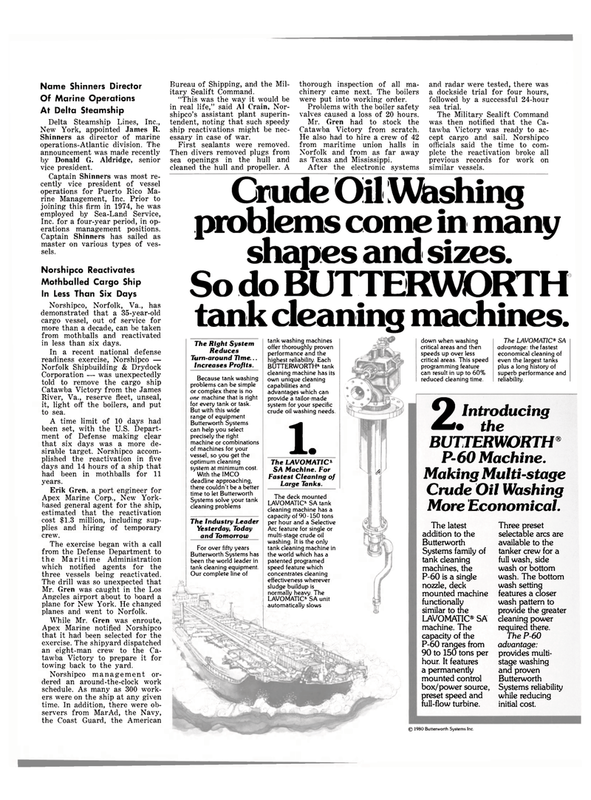 Butterworth Systems has been the world leader in tank cleaning equipment. BUTTERWORTH* tank cleaning machine has its own unique cleaning capabilities and advantages which can provide a tailor-made system for your specific crude oil washing needs. 1. LAVOMATIC* SA unit automatically slows down when washing critical areas and then speeds up over less critical areas. This speed programming feature can result in up to 60% reduced cleaning time. P-60 ranges from 90 to 150 tons per hour. It features a permanently mounted control box/power source, preset speed and full-flow turbine. © 1980 Butterworth Systems Inc.
Three preset selectable arcs are available to the tanker crew for a full wash, side wash or bottom wash. The bottom wash setting features a closer wash pattern to provide the greater cleaning power required there. Systems reliability while reducing initial cost.